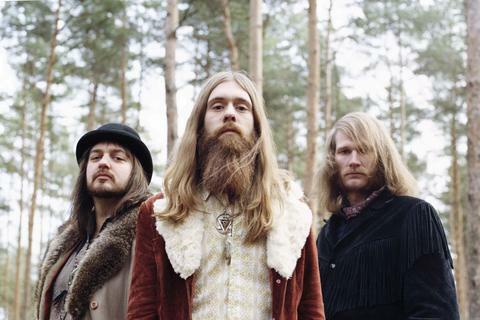 KADAVAR are the new sensation within the extraordinarily vital Retro Rock / Doom / Psychedelic Rock genre. The Berlin based trio consists of Wolf (vocals / guitar), Mammut (bass) and Tiger (drums). Together they revel in 70s occult Rock, Proto Metal and Psychedelic Rock in the veins of Black Sabbath, Pentagram or Hawkwind. KADAVAR's self-titled debut album which was released at the beginning of March hit the scene like a bomb: The vinyl-only release which is being published by the German DIY-label This Charming Man Records in cooperation with American Tee Pee Records sold out three editions (3.000 copies) within 8 weeks of its release. A worldwide CD- and Download-Release of the album is slated for July 2012 via Tee Pee Records. Dubbed "a phenomenon" by Visions, one of the biggest German music magazines, KADAVAR can only rub their eyes in disbelief upon their meteoric rise: By the end of the summer the band will have played supports for Sleep, Pentagram, Saint Vitus and Electric Wizard, festival shows are booked at Desert Fest, Stoned From The Underground, Yellowstock Festival, Duna Jam, Roadburn 2013 the band's show in Köln on 12.06.2012 will be taped and aired by the legendary TV-program Rockpalast and generally word about KADAVAR is spreading faster than they can count their new Facebook-likes.